Farmers looking for ways to increase their crop output are using more technology and relying a little less on intuition. Farmers associated with Land O'Lakes, a dairy-focused, agricultural cooperative in Minnesota, are using online tools and apps to visualize their fields and to analyze the data in such areas as water management, seed placement and crop diseases. To do that, Land O'Lakes, known for producing the top butter brand in the U.S., has turned to Google's public cloud. The company is involved in a $3.5 million project with Google and expects to see a payback on it in two to three years. Why Google's cloud, when Land O'Lakes was already working with Amazon Web Services (AWS) and Microsoft's Azure clouds for other projects? The answer lies with Google Maps. Teddy Bekele is vice president of IT at Land O’Lakes. "With the ability to use Google Maps to be able to visualize our data, our land, that's really helpful," said Teddy Bekele, vice president of IT for the distribution division of Land O'Lakes. "They have tools that give them insights and help them make decisions instead of just relying on intuition. We've moving into an age where decisions are based on data and analysis. You can use data to improve your crops and the output of your field." Bekele said that data analysis can't be done without the cloud. "The goal is to figure out how to harness tech advances to the traditional farming and business model," he said. "The more science and data-driven decisions you can bring to a farmer, the more he'll trust you and commit his business to you." Improving crop output is important for Land O'Lakes, a $13.5 billion company with nearly 10,000 employees. The member-owned company, which is nearly 100 years old, has about 3,600 direct producer-members and 1,000 member-cooperatives. It also processes and distributes products for about 300,000 agricultural producers. The co-op also is one of the largest producers of butter and cheese in the U.S., processing 13 billion pounds of milk per year. With that direct link to farming, agricultural output is critical to Land O'Lakes. For example, Bekele said, corn is the biggest crop grown in the U.S., with average crop production in 2015 at 170 bushels per acre. However, in 2015 the maximum recorded output in the U.S. was 503 bushels per acre. There's a huge gap between what corn farmers are producing and what they could produce, Bekele said, and he would like to turn that around. "The genetic potential is there to produce more, but because of environmental conditions, soil types and certain practices, we just aren't able to achieve that," he said. "If the average went from just 170 to 180 an acre, that would be equal to 5 million more virtual acres." The answer to boosting that average yield per acre may lie with technology, Bekele said. There are 40 key decisions a farmer makes throughout the life cycle of a crop, he said. They have to decide, for instance, how much nitrogen to add to the soil and when; what type of seed to use and where to place it; and when to water the crops. Technology can help farmers make most of these decisions. The problem has been that farmers use little of this technology because the tools they need haven't been centralized, and it takes hours to input the same data about their fields and crops over and over again. Those tools are slowly being centralized, and farmers working with Land O'Lakes can access them in the cloud and input their farm data just once, saving time, money and aggravation. Land O'Lakes is using the Google cloud and its integrated Google Maps to help farmers visualize their fields and their data. Using a public cloud, the company created a data repository with information on farmers' field boundaries, seed prescriptions for the fields, plant nutrient history and tissue sample data. That data can be used by five tools that Bekele has added to the cloud. He's working on adding another five and hopes to have 20 to 25 tools available to farmers in the next 12 to 18 months. The project is just starting to roll out so only 25 to 30 farmers are using it. But in 12 to 18 months, Bekele said he expects to have 20,000 to 30,000 farmers using it. 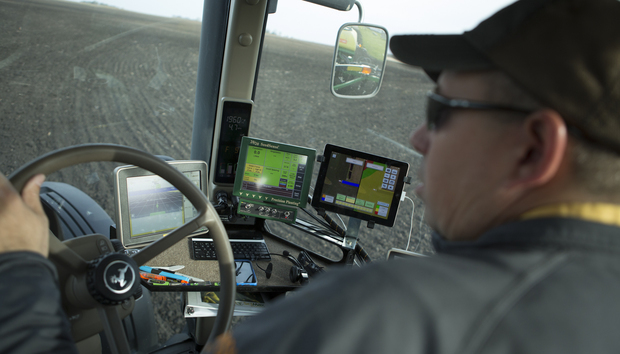 "As a farmer, my data is all in the cloud and all the tools are in the cloud," he said. "It will mean the ability to use multiple tools and make better decisions and better production with the same input … If we had done this with our legacy systems, we couldn't have achieved it. The amount of data and the ability to scale it, it would have been too much." Bekele said Land O'Lakes will use Google's machine-learning tools to analyze data and find patterns, but he was mainly pulled to Google's cloud because Google Maps was integrated with it. "With the farms' field boundaries, Maps can give a geospatial location to them," he explained. "Anything that goes into this central cloud has a point -- a location. With the ability to use Google Maps, we are able to visualize our data, our land. That's really helpful. When you put seed on the ground, you can see the way it looks on a map." With Maps, farmers can visualize where they've already sprayed their crops and what areas need attention. When they log in the nutrient value of a tissue sample from an ear of corn, for instance, they can see what part of the field it came from. "Being able to visualize it in a mapping format is kind of critical," Bekele said. "When you say Field A, that could mean different things to different people. You need to see which field and which part of a field someone is talking about." Dan Olds, an analyst with The Gabriel Consulting Group, said this a smart move for Land O'Lakes. "I think Land O'Lakes is making the right decision because exact geographic locations are so important to what they're trying to do," he said. "This is where Google's multiproduct approach really pays off. If Google didn't have Maps, they would have much stronger competition for this type of business." Farming has become data and tech driven, Bekele added. "The biggest factor in crop production is weather. You can't control it," he said. "You have to work around it. Now, though, you can't control the weather, but you can control what you do and you can try to react in the right way. I think the cloud plays a big role in that. It helps us get to the next frontier. It's about big data and scaling up our ability to run big analytics and the ability to learn from a variety of factors." One of the biggest challenges Land O'Lakes has had to tackle is working with different cloud vendors. Bekele said the company hasn't gone all-in with one cloud vendor because it prefers to use the vendor that works best for a specific project, which also enables Land O'Lakes to learn about each cloud company. That also means that Land O'Lakes' IT workers need to be able to work with different vendors. According to Olds, using multiple cloud vendors can be worth the extra work and training. "Having multiple vendors means you 'keep 'em honest' by letting them know you have alternatives in case they screw up," he said. "Having multiple vendors also means that a problem that is confined to one vendor, like a service outage, won't take your entire business down." An even bigger challenge for Land O'Lakes, however, was managing security, especially around the mapping pieces in their cloud. "We needed more security so we can share [information] with growers and nobody else… so we needed workarounds," Bekele added. "Some services, like the security piece and being able to share data and access to shared files and then rescinding that access – wasn't as built-up as I'd like."